Arthur Wilton Brown (born 24 June 1942) is an English rock singer and songwriter best known for his flamboyant theatrical performances, eclectic (and sometimes experimental) work and his powerful, wide-ranging operatic voice. He has been a significant influence on a wide range of musicians due to his vocal style, wild stage persona, and concepts; he is considered to be a pioneer of shock rock and progressive rock and has had an influence on heavy metal music. Brown has been lead singer of various groups, most notably the Crazy World of Arthur Brown and Kingdom Come, followed by a varied solo career as well as associations with Hawkwind, the Who, Jimi Hendrix, Klaus Schulze and Frank Zappa. He is best known for his 1968 single "Fire", reaching number one in the UK Singles Chart and Canada, and number two on the US Billboard Hot 100 as well as its parent album The Crazy World of Arthur Brown which reached number 2 on the UK album charts and number 7 in the US. Kingdom Come's 1973 album Journey was "most noted in retrospect as one of the first rock records to use a drum machine, which was still quite a novelty back in 1973." Following the success of the single "Fire", the press would often refer to Brown as "The God of Hellfire", in reference to the opening shouted line of the song, a moniker that exists to this day. Brown was born in Whitby where his parents ran a guest house. After attending Roundhay Grammar School in Leeds, Yorkshire, he attended the University of London and the University of Reading and studied philosophy and law, but he gravitated to music instead, forming his first band, Blues and Brown, while at Reading. After a spell fronting a number of bands in London, Brown then moved to Paris in 1966, where he worked on his theatrical skills. During this period he recorded two songs for the Roger Vadim film of the Émile Zola novel La Curée. Returning to London around the turn of 1966 to 1967, he was a temporary member of a London-based R&B/soul/ska group the Ramong Sound that would soon become the hit-making soul group the Foundations. By the time the Foundations had been signed to Pye Records, Brown had left the group to form his own band, the Crazy World of Arthur Brown. The band included Vincent Crane (Hammond organ and piano), Drachen Theaker (drums), and Nick Greenwood (bass). Brown quickly earned a reputation for outlandish performances, which included the use of a burning metal helmet, that led to occasional mishaps, such as during an early appearance at the Windsor Festival in 1967, where he wore a colander on his head soaked in methanol. The fuel poured over his head by accident caught fire; a bystander doused the flames by pouring beer on Brown's head, preventing any serious injury. The flaming head then became an Arthur Brown signature. On occasion he also stripped naked while performing, most notably at the Palermo Pop 70 Festival in Sicily, Italy, July 1970, where he was arrested and deported. He was also notable for the extreme make-up he wore onstage, which would later be reflected in the stage acts of Alice Cooper and Kiss. He was also famed for his powerful operatic voice and his high pitched screams. By 1968, the debut album, The Crazy World of Arthur Brown became a hit on both sides of the Atlantic. Produced by the Who's manager Kit Lambert, and executive-produced by Pete Townshend on Track Records, the label begun by Lambert and Chris Stamp, it spun off an equally surprising hit single, "Fire", and contained a version of "I Put a Spell on You" by Screamin' Jay Hawkins, a similarly bizarre showman. "Fire" sold over one million copies, and was awarded a gold disc. The song has since seen its opening line "I am the God of Hellfire" sampled in numerous other places, most notably in the Prodigy's 1992 rave anthem "Fire". In the late 1960s, the Crazy World of Arthur Brown's popularity was such that the group shared bills with the Who, Jimi Hendrix, the Mothers of Invention, the Doors, the Small Faces, and Joe Cocker, among others. Theaker was replaced because of his aviophobia in 1968 by drummer Carl Palmer, later of Atomic Rooster and Emerson, Lake & Palmer, for the band's second American tour in 1969, on which keyboardist Vincent Crane also left – although he soon returned. However, Crane and Palmer eventually left in June 1969 to form Atomic Rooster, spelling the end for the Crazy World of Arthur Brown. Victor Peraino used the EMS VCS 3 synthesizer on the album Journey. The three Kingdom Come albums each have a distinctive character. The first was a highly complex concept album apparently on the theme of humanity living in a zoo and being controlled by cosmic, religious and commercial forces. The second was loosely on the theme of water, which Brown had declared four years earlier would be the subject of the second album by the Crazy World. It was musically more conventional than the first, much less heavy, though stranger in places. The third album, Journey (1973), recorded in Rockfield Studios in Wales, was a space rock album, with Brown playing an early drum machine and thereby replacing a series of drummers. The band also recorded three of its songs in a live Peel Session for the John Peel BBC Radio 1 show on 25 September 1972. Richie Unterberger of Allmusic said that the album has been "most noted in retrospect as one of the first rock records to use a drum machine, which was still quite a novelty back in 1973." Brown recalled "the whole album is based around the drum machine, and we had a lot of ideas that we wanted to explore using this technology. The drum machine they used was the Bentley Rhythm Ace, the British version of the FR-1. The stage acts for all three albums featured a wild mix of special effects, dramatic costumes and colourful theatrics, which were sometimes controversial. Brown had declared when Kingdom Come was formed that the intention was to create a multi-media experience and the band always followed that policy. The concepts, the music and the theatrics proved very popular on the university circuit but proved too way-out for a mainstream audience. The band appeared at the 1971 Glastonbury Festival in Somerset, England and featured in the Glastonbury Fayre film which was shown in cinemas. In later years, Brown released several solo albums. In 1975, he appeared in the Who's rock opera movie Tommy as "The Priest". Later that year he contributed vocals to the song "The Tell-Tale Heart" on the Poe-based concept album Tales of Mystery and Imagination by the Alan Parsons Project. In 1979 and 1980, he collaborated with German electronic musician Klaus Schulze, and can be heard on the albums Dune, ...Live... and Time Actor. Also, In 1979 he moved to Africa and lived there for six months. He directed the Burundi National Orchestra, a nine-piece rock group that played Jimi Hendrix songs and local music. In the 1980s, Brown moved to Austin, Texas, where his wife came from, and obtained a master's degree in counselling. On 17 January 1987, Brown performed "Fire" on the "Flashback" segment of the television programme Solid Gold. Together with former Mothers of Invention drummer Jimmy Carl Black, he also became a painter and carpenter for some years, and released an album with him, Brown, Black & Blue (1988). In 1992, Brown and fellow counsellor Jim Maxwell founded Healing Songs Therapy, a service that culminated in Brown creating a song for each client about their emotional issues. Brown returned to England in 1996. 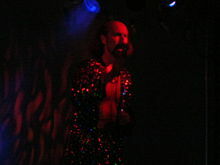 In 1997, he re-recorded "Fire" with German band Die Krupps, while in 1998, he provided a spoken-word performance on Bruce Dickinson's The Chemical Wedding album, reading a portion of three poems by William Blake, and appeared as Satan in Dickinson's music video for "Killing Floor". He was narrator for the Pretty Things' live performance of their album S. F. Sorrow (1998) at Abbey Road Studios. He also appeared on television, guesting on Kula Shaker track "Mystical Machine Gun" several times during 1999. A further change of musical direction occurred, when he formed an acoustic band and went on tour with Tim Rose in 1999. This band then added Stan Adler (cello and bass) and Malcolm Mortimore (percussion) and produced the album Tantric Lover (2000). However, the lineup did not last, and Brown put a new band together with guitarist Rikki Patten and multi-instrumentalist Nick Pynn. In 2002, Brown was asked to support Robert Plant on his Dreamland Tour. By now Patten had been replaced by guitarist Chris Bryant. Brown was getting some more media exposure now. His band was briefly called the Giant Pocket Orchestra, and also Instant Flight. In the middle of this, in 2003, Brown released Vampire Suite (2003), an album with Josh Philips and Mark Brzezicki of the band Big Country, released on Ian Grant's Track Records. Also around this time, Brown's back catalogue was re-released by Sanctuary Records. Brown reunited the surviving members of Kingdom Come (except Des Fisher) in 2005, for a one-off concert at The Astoria in London, performing material from Kingdom Come's album Galactic Zoo Dossier, with an encore of "Spirit of Joy". This show won Brown the 'Showman of the Year' award from Classic Rock magazine, with Brown receiving the award at the Classic Rock Roll of Honour Awards ceremony held in London's Café de Paris. In 2007, Brown and Pynn released Voice of Love on the Côte Basque record label, featuring a number of original recordings. In August 2007, during a concert in Lewes, East Sussex, England, Brown once again set fire to his own hair. While trying to extinguish the flames, Phil Rhodes, a member of the band also caught fire. Brown carried on after the fire was put out; he had however lost a few chunks of hair. He appeared as a priest in the video for the Darkness song, "Is It Just Me?". In 2009, a roll-out re-release of Brown's back catalogue was commenced by Cherry Red Records' subsidiary Lemon Recordings and continued from 2010 onwards on their sister label Esoteric Recordings. In 2010, Brown played a set at the Glastonbury Festival in the Glade. On 10 June 2011, days before his 69th birthday, he played at the Ray Davies Meltdown Festival at the Queen Elizabeth Hall, London where he invited Z-Star to duet with him. Six weeks later, again in London, he played the High Voltage Festival; the gig was recorded and released (on vinyl only) as The Crazy World of Arthur Brown Live at High Voltage. In 2012, Brown and Rick Patten released The Magic Hat alongside a comic of the same title by Matt Howarth – a curious, cross-dimensional adventure facilitated by a flaming helmet. In 2013, as the result of a successful pledge campaign on PledgeMusic, Brown released the album "Zim Zam Zim" based on the cosmos having recorded it in his yurt in Lewes. On 2 July 2017, the Crazy World of Arthur Brown performed at the Royal Albert Hall's Elgar Room. Almost 50 years ago, musical icon Arthur Brown stepped out on stage, five-foot tall flames leaping from his head, and uttered one of rock music’s most stirring lines: “I am the God of Hellfire.” At that point, the British theatrical rocker who brought us the Crazy World of Arthur Brown in '68 had no way of knowing that he would come to be seen as a major pioneer in not only progressive rock and heavy metal, but the entire concept of what makes a stage show. He’s influenced generations of musicians who searched for an edge, from King Diamond, Kiss, and Peter Gabriel to Marilyn Manson, Rob Halford, and Alice Cooper. —"The God of Hellfire Speaks: 73 Years Inside the Crazy World of Arthur Brown", Vice magazine, 2013. Though Brown has had limited commercial success and has never released another recording as commercially successful as "Fire", he has been a significant influence on Alice Cooper, David Bowie, Peter Gabriel, Marilyn Manson, George Clinton, Kiss, King Diamond, Rob Halford of Judas Priest and Bruce Dickinson of Iron Maiden, among others, and his songs have been covered or sampled by a range of artists including Ozzy Osbourne, the Prodigy, Marilyn Manson and the Who. Brown's voice, and in particular his high banshee screams, are a precursor to the banshee screaming of many later heavy metal singers, and his theatrical concepts and stage presence such as the face makeup, especially his black and white face paint (corpse paint), voodoo dancing, and flaming helmet pioneered a lot of what was to become shock rock and progressive rock. The third and final Kingdom Come album, Journey (1973), is noteworthy for being one of the first rock albums to feature a drum machine, especially on the track "Time Captives". Brown has had a number of associations with Hawkwind. In 1973, he was one of the performers on Robert Calvert's album Captain Lockheed and the Starfighters, together with a number of other Hawkwind members. In 2001 and 2002, Brown made several guest appearances at live Hawkwind concerts, subsequently touring with them as a guest vocalist. On their December 2002 tour, Hawkwind played several songs by Brown from the Kingdom Come era, along with "Song of the Gremlin", which Brown had sung on Captain Lockheed and the Starfighters; this was documented on the Hawkwind DVD Out of the Shadows. Brown also provided vocals on two of the tracks on Hawkwind's studio album Take Me to Your Leader, released in 2005. One is the spoken-word "A Letter to Robert", where Brown recalls a conversation with Robert Calvert. Brown continued his association with Hawkwind, touring with a support set for them on their 40th anniversary tour in the United Kingdom in 2009. In 2018, Brown was a guest vocalist on the first five dates of Hawkwind’s UK tour. ^ Arthur Brown's Kingdom Come has no link with the American/German hard-rock/glam band of the same name. ^ Marshall 2005, p. 25. ^ "Official UK Singles Top 100 – 16th February 2013 | Official UK Top 40 | music charts | Official Singles Chart". Retrieved 16 February 2013. ^ "Crazy World of Arthur Brown - Full Official Chart History". Official Charts Company. Official Charts Company. Retrieved 19 January 2016. ^ a b "Journey – Arthur Brown's Kingdom Come, Arthur Brown – Songs, Reviews, Credits – AllMusic". AllMusic. Retrieved 2 January 2018. ^ Unterberger, Richie. Urban Spacemen and Wayfaring Strangers, p. 46. ^ a b c d e f g h i Larkin, C., Virgin Encyclopedia of Sixties Music (Muze UK Ltd, 1997), ISBN 0-7535-0149-X, p. 77. ^ "Arthur Brown interview about Crazy World & Kingdom Come". It's Psychedelic Baby. Retrieved 2017-05-06. ^ "Guitarist/Composer". Alan Warner. Retrieved 16 February 2013. ^ Marshall 2005, pp. 61–62. ^ Marshall 2005, pp. 94–101. ^ Murrells, Joseph (1978). The Book of Golden Discs (2nd ed.). London: Barrie and Jenkins. p. 236. ISBN 0-214-20512-6. ^ Marshall 2005, pp. 106–111. ^ a b Journey (liner). Kingdom Come. Castle Music. 2003. ^ Journey (liner). Kingdom Come. Esoteric Recordings. 2010. ^ "The Glastonbury Festival 1971". Ukrockfestivals.com. 1971-06-26. Retrieved 2014-07-25. ^ Robbins, Ira; Robbins, Ira (1985-09-12). "Where Are They Now: Arthur Brown". Rolling Stone. Retrieved 2019-02-25. ^ "The Return of the Hellfire God: Arthur Brown Is Back and Still Crazy After 47 Years". LA Weekly. 2 January 2018. ^ "Solid Gold – Season 7, Episode 16: Solid Gold 87 Show 16 w/ Chicago". TV.com. 5 February 2008. Retrieved 16 February 2013. ^ Marshall 2005, pp. 204–206. ^ "Classic Rock Roll of Honour Awards: Winners Announced". Blabbermouth. 2 January 2018. ^ "God of Hellfire Arthur Brown burnt in stage stunt – Local". Sussex Express. 30 August 2007. Retrieved 16 February 2013. ^ Whyte, Woodrow (29 August 2014). "The Life of Arthur Brown and 'Zim Zam Zim'". Drowned in Sound. ^ yesadmin (2 April 2019). "YES Announces "The Royal Affair Tour" Launching June 12 In Bethlehem, Pa". Retrieved 2 April 2019. ^ Marshall 2005, pp. 85 and 153. ^ Marshall 2005, p. 175. ^ Marshall 2005, p. 172. ^ Marshall 2005, p. 103. ^ Marshall 2005, pp. 121–125. Marshall, Polly. The God of Hellfire, the Crazy Life and Times of Arthur Brown. SAF Publishing, 2005. ISBN 0-946719-77-2.